Pat Dye Jr. Cuffed at NFL Combine? That Mississippi Coach’s Agent Escapes? I am *shocked* that Pat Dye Jr. would allegedly be involved in something like this. Where was super agent Jimmy Sexton? Was he IN A VAN DOWN BY THE RIVER! (Oh, cmon…..tell me he doesn’t look like Chris Farley/Matt Foley). This could get interesting, quickly if they heed his advice. Carpenter: Media on a Mallet Witch Hunt? I have to give T.J. Capenter credit. I have taken major issue with his work in the past (particularly his apparent man crush on CBS loud mouth Gregggggg–that’s how he spells it…o.k. not quite–Doyel and his stoking of the Florida Hat Gate controversy) but he nails the Mallett media mishap that wasn’t. Posted in Commentary | Comments Off on Carpenter: Media on a Mallet Witch Hunt? –If you, unlike me, have a life, then you missed the breathless breakdowns of former Arkansas quarterback Ryan Mallett’s media (non) meltdown at the NFL Combine (much ado about nothing, IMO) as well the breathless breakdowns of the aerial display (I like that comparison a lot better than the Ryan Leaf one) he put on a day later. I am shaking my head on all this. It is a perfect example of everything that is wrong with our Blogocracy. I understand why Ryan Mallett raises red flags, but what I don’t understand is why he is getting skewered, but others, with just as many perceived issues are seemingly getting a pass. Oh, and as for the rumors that no one is willing to stand behind, but every has been or never was is willing to trot out, I’ll just say I highly doubt Ryan Mallett has abused drugs the last few years while breaking every Arkansas passing record and leading the school to its first BCS bowl bid. If he has, he’s one heckuva multi-tasker. On the other hand, if he, for the sake of argument, smoked a little gangha in college, then he is clearly the scourge of the Earth, because no one ever does that in college. –I am still reeling from the Kirk Douglas/Melissa Leo Daily Double of Painful Awkwardness and Elephantitis of the Ear Lobe. –If Anne Hathaway is wrong, I don’t want to be right. –Watching James Franco co-host The Oscars made me want to saw my own arm off. –Anne Hathaway changed dresses 3 times while I was typing this post. –I think we all expected Christain Bale to give us one of the most poignant, humble speeches of the night. I know I did. Except not really. –Does the fact that I laugh at the dry wit of every British celebrity (like Colin Firth) mean that I am getting old? UPDATED: Mallett seems to have performed well in the interviews that mattered. Three teams that met with Mallett at the combine said they had no problems with his responses to the drug allegations or with his demeanor. Mallett was arguably the most impressive prospect throwing the ball during the Sunday on-field session for quarterbacks. He exhibited the strong arm most scouts expected of him and was very accurate as well. More accurate, notably, than former Auburn star and Heisman Trophy winner Cam Newton, clearly the most celebrated player among the 330 prospects invited to Indianapolis last week. The physical difference wasn’t the lone disparity between the players, said an assistant coach from an AFC club that might be interested in choosing a quarterback in the draft in two months. Just for a while, last night, it must have seemed like old times in Bud Walton Arena. Here’s a free game story from the good folks at Hawgsillustrated.com. Thank them for their kindness by clicking on the banner ad. I was impressed with the Hogs’ resiliency. There were several times they could have folded up, and didn’t. While Marshawn Powell and Rotnei Clarke did the heavy lifting for the Hogs (as is usually the case when they win) the three-headed “monster” that was a guard rotation of Jeff Peterson, Julysses Nobles and Marcus Britt (with a little Mardracus Wade mixed in) chipped in big plays to pull it out. I think it was a job saver for Coach Pelphrey. And, it felt good to finally beat UK, again. If you watched the game even for a second, you know that it had been TEN YEARS since Arkansas beat Kentucky in Bud Walton Arena. First the Albert Pujols fiasco, now St. Louis Cardinals ace Adam Wainwright looks to be toast for a long, long time. Bitter. I am. At least that’s what can be inferred from UA Forward Marshawn Powell’s “No comment” when given the opportunity today during a press conference to dispel rumors that his relationship with UA Hoops Head Coach John Pelphrey isn’t all “Peaches and Overachievin”. Normally, I would say this is much ado about nothing, because player and coach head butting is common. But, this is one of the areas that was allegedly addressed in what has otherwise been another lackluster, wasted season. Here’s to hoping that Marshawn and Coach Pelphrey hug it out, because the 2011-2012 season that everyone on The Hill is pointing to won’t be much better (even with a vaunted recruiting class) unless the Hogs have a healthy, experiened and productive inside presence. Since Mauk asked, here it is. Earlier this week two female wrestlers made history in Iowa by becoming the first to ever qualify for the state tournament. Then a few days ago another Iowa sophomore wrestler made national news by refusing to wrestle one of the girls. Northrup & Herkelmann at the sign-in table before the default. Wrestling is huge in Iowa. In many towns it is the most popular high school sport surpassing basketball and sometimes even football. State tournament time is like late Christmas. You wait for it all year and can’t believe when it finally arrives. So to make a decision like this must have been very difficult to do and the fact that it’s being discussed on a national stage just punctuates the statement. The Northrup family issued a statement about the issue. The general idea is that his religion (Pentacostal) does not allow him to be violent towards women. Because wrestling can be a very dangerous and violent sport, Northrup could not wrestle Herkelmann because he would be acting in a violent manner towards her. The ESPN article has several very positive comments from both the Herkelmann and Northrup families. If this becomes a controversial topic of interminable blog life, we’ll have no one to blame but ourselves. And Mauk. P.S. All three wrestlers are out of the tourney. Herkelmann’s only win was the default over Northrup. Northrup won his first consolation match then lost and was eliminated. but he completely nailed the Albert Pujols situation. Report: NCAA/Cam Newton Investigation Ongoing. I thought this was over. Oh wait, I never did. I am sure nothing will come of it. Posted in Sports | Comments Off on Report: NCAA/Cam Newton Investigation Ongoing. per the inimitable Sports By Brooks. I am sure there’s nothing to it. when Albert Pujols and the St. Louis Cardinals failed to reach an agreement in advance of Pujols’ artificial 11 a.m. deadline. This all but guarantees Pujols’ will reach the free agent market next winter, and some billionaire that DOESN’T own my Cardinals will fire off an astronomical bid and lure Pujols away from The Gateway City. I previously thought Pujols’ would not pull a Lebron, but considering that the stubbling block seems to be that the Cardinals are unwilling to guarantees years 8,9, and 10 at $30 million per, when Pujols will be approaching, and then passing his 40th birthday, and would have already banked well over $300 million in his career in baseball salary alone by 2020, I am not so sure. But, at least this won’t be a distraction for the 2011 Cardinals. First No Mississippi Rebel Land Shark, Now No Harry Baals Government Center? I thought twice about posting this link, but if it’s good enough for the Associated Press, it’s good enough for me. Heck, they even went “Next Level” with the headline. The Onion is undoubtedly proud. This was funny to me. To others, I am sure it’s a (bad) sign of the times. If I could pick one mentor for a young guy trying to learn the ropes in the infield it would be The Secret Weapon, Jose Oquendo. 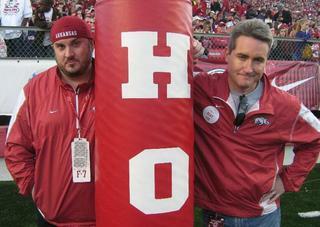 who returned to the air today in NWA and on the web at The Hog Sports Radio Network. Work intervened, and I was unable to listen, but, as expected, the early reviews I have gotten have been good. Be sure and check these guys out. They are old friends of ours, but they are really good at what they do. And, to say we need more quality local sports radio options is a big understatement. Welcome back, guys. (even though our basketball team has been disbanded due to Title 9 Regulations …..what’s that? It hasn’t been disbanded? We still have a team? Really?!?!?!). 1.Wide Receiver Greg Childs and Running Back/Kickoff Returner Dennis Johnson return next year at what should be 100%. 2. We still have baseball and Dave Van Horn. 6. Michael Bush is a free agent and Hue Jackson was not the guy who orchestrated the whole “Let’s ignore Darren McFadden and give Bush the ball the entire 2nd quarter” philosophy. 7. Ryan Mallett’s stock is falling… the good news is that he will probably be drafted by a solid team now ala Big Ben and Aaron Rodgers. 8. We can start the Knile Davis for Heisman campaign right now. Why not? Hagers, your thoughts? 10. We have just as much of a chance to go to another BCS Bowl as we did last year. Feel freee to add your own. I need some sports Prozac, STAT. You can thank BlogHawgs multimedia frontman Kris Boyd for this gem. when I think role models, I think of Charlie Sheen, who was asked to give a pep talk to the UCLA baseball team yesterday, and delivered like only Charlie Sheen can deliver. You know it’s a motley motivational crew when Milton Bradley and Coco Crisp are the “safe” speakers in the group. A Never-Too-Early Hog Football (Recruiting) Fix. Apparently, Arkansas’ recent recruiting classes tend to be better these days once they actually get to campus and on the field. The latest potential example–the 2011 recruiting class Arkansas just signed –was ranked a respectable 16th in the nation by Scout.com. That’s particularly notable when you consider that Arkansas’ classes that populated the 2010 team that went 10-3 and earned the school’s first BCS bowl bid were ranked 30th (2006), 34th (2007), 24th (2008) 20th (2009) and 35th (2010) by Scout.com. Those rankings and the success of Head Coach Bobby Petrino and Arkansas suggest recruiting really isn’t just an inexact science–it isn’t a science at all. Si.com further illustrated that point recently by re-ranking the 2008 class. Who were the big movers? Oregon and……Arkansas. Meanwhile, Texas’ classes were initially ranked 3rd (2006), 3rd (2007) 16th (2008) 7th (2009) and 3rd (2010) nationally by Scout.com. The takeaway, at least for me, is that recruiting is important, but so is development, and the Razorbacks’ football brand is experiencing a revival thanks to the efforts of its coaching staff (with recruiting rain makers like Tim Horton, Garrick McGee and Steve Caldwell) on the recruiting trail, and on campus. Posted in Sports | Comments Off on A Never-Too-Early Hog Football (Recruiting) Fix.